As Europe steps up its fight against climate change, we must heed the lessons of the digital revolution. When digitalization began to gather pace two decades ago, Europeans failed to embrace its potential. The political narrative too often cast it as a threat to jobs. By contrast, US firms grasped the opportunity. Now they dominate the digital economy, while Europe struggles to keep up. We must not make the same mistake when it comes to climate action. Neither the global economy nor the planet has a future without climate action. The world’s future economy must marry digitalization and innovation with climate action. 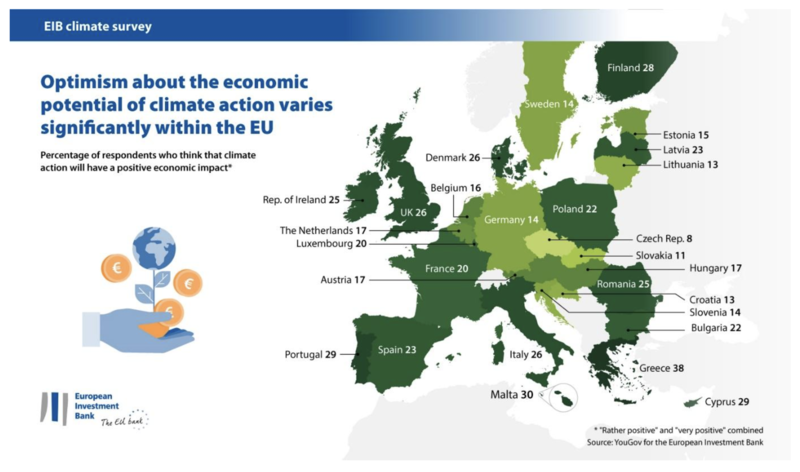 Yet our first-of-its-kind European Investment Bank (EIB) Climate Survey shows that Europeans are less optimistic than Americans about the role climate action can play in economic growth and job creation. 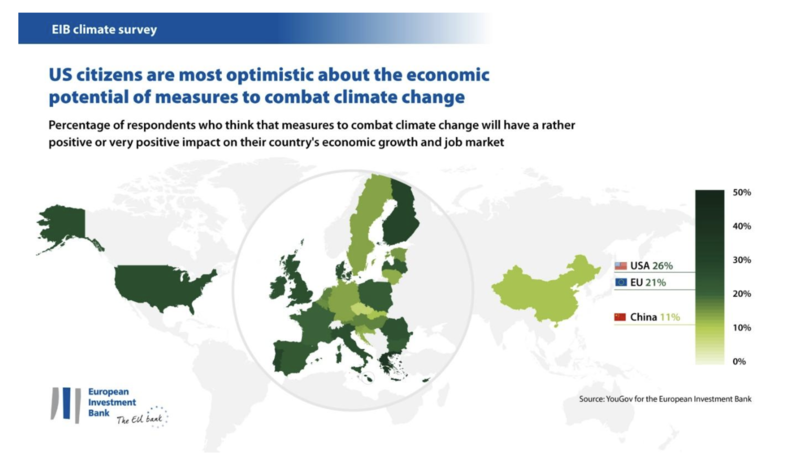 Only 21% of Europeans believe climate action will have a positive or very positive effect on growth and jobs. Even in the face of major climate change denial or scepticism from some of their political leaders, Americans are more optimistic than Europeans, with 26% expecting climate change to be good for the economy. The lesson here is that it is not only for the sake of the climate that we must invest now in renewable energy and energy efficiency. It is also economically vital for Europe. Climate action is a moral imperative and we must work globally to ensure everyone’s survival. It is also a market in which there are opportunities everywhere for economic growth and job creation. Europeans are clear about the future they want. Our survey shows that 78% of Europeans are “concerned” or “alarmed” about climate change. Only 1% deny that it is happening. Putting Europe on a sustainable growth path means working together to make our economies greener, more resilient and more inclusive. It requires support for a circular economy that will reduce our environmental footprint and strengthen Europe’s competitiveness. Investing in Europe’s productivity, strengthening competitiveness and reducing inequality must go hand-in-hand with lower emissions. Three years ago in Paris, the UN’s COP21 conference reached an historic agreement to limit the increase in world temperatures. The climate conference takes place annually. The latest edition in Katowice last December was COP24. We have made progress since Paris, but the difference between 21 and 24 demonstrates that the clock is ticking. Thanks to the Paris agreement we are on the right track. But we are far behind schedule. There is no time for complacency. What do I say to those who argue that climate action is a gamble on future economic benefits and unknown climatic events? Firstly, the science is conclusive. The unfolding disaster of climate change is evident. Secondly, profits and jobs have stagnated or declined in many polluting industries for decades. Contrast that with concrete evidence of job growth in green economies over the last few years. Since 2012, the number of jobs in the renewable energy sector has grown 45% worldwide, compared to an increase in all jobs of only 5%. 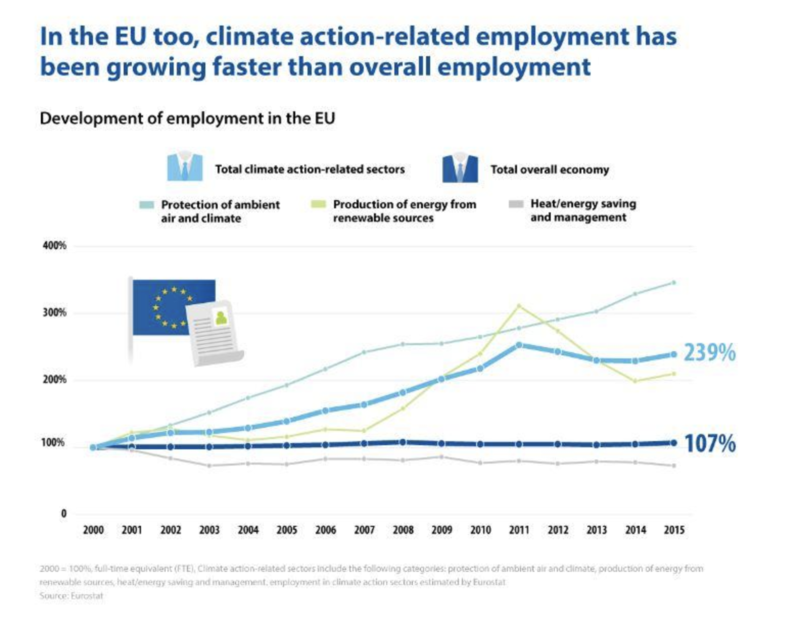 In the EU, the increase is still more striking, with renewable energy jobs more than double their level in 2000, against a 7% overall increase in jobs. The transition to a sustainable, low-carbon economy could be worth €23 trillion by 2030. To many it still looks like a risk. In some ways they are right, because investments in new sectors are inherently risky. That is why the EIB - the EU’s bank - has committed to investing $100 billion in climate action in the five-year period to 2020. When we back projects, we mitigate the risk for private investors just enough that they feel secure in joining this new wave of green finance. The private sector can and must lead climate action. There is not enough public money in the world to achieve our goals in reducing emissions or mitigating the effects of climate change. By reducing the initial investment risk, multilateral banks help crowd-in private investment. We also back cities and towns - more than 1,000 around the world - that seek financing for sustainable urban infrastructure. And, of course, the EIB also makes loans directly to sustainable private sector projects. Here is where our partnership with citizens is so vital - and where the EU’s supportive policy regime gives us an advantage. The EU passed 29 climate-friendly laws last year, compared to eight in the US and only four in China. These laws can nudge investment towards the public good. They have the power to spur and support investment from international financial institutions, whose loans are rooted in economic and policy goals. We watch the bottom line, but our strong inclination is to draw it in green ink. We have made the right policy decisions in Europe. We must not risk losing economic momentum. Just as we must not be distracted from the moral fight for climate action by those who doubt the science, let us not fear that new energy technologies will hamper growth or come at the cost of jobs. The action we take to save our planet will build a sustainable environment for our children and grandchildren. It will also provide them with jobs and prosperity.